Dater Dies. A number of obviously fake ticket validator dies have surfaced recently. The dies all seem to have been made for the Cosmo style of dater which was manufactured by the A.D. Joslin Company. The fakes all seem to have uniform size lettering, as shown on the Tower Grove die, and the letter spacing and wording is sometimes odd. Contrast the Tower Grove fake with the Prescott authentic die for a comparison of styles. It appears that the fake dies were made by the original company, A.D. Joslin, since they are well machined and fit Cosmo dater machines perfectly. Baggage Tags. Baggage tags are small, flat pieces of metal, usually brass, that were used in the early days of railroading to allow passengers to check and reclaim luggage. They were stamped with information like numbers, railroad names, and cities (routing), and can have considerable historical value. Because they command high prices among collectors and are very simple in construction, baggage tags are an especially attractive target for counterfeiters. Fake tags can and have been easily produced, and reports are becoming increasingly frequent about such counterfeits showing up on Internet auction sites. One counterfeit example that has surfaced recently is a tag marked "M&NA" for the Missouri and North Arkansas Railroad. An image of this tag can be seen on a web page devoted to fake baggage tags, which is part of a larger site on authentic tags maintained by Scott Czaja. Scott identifies the MN&A tag as suspect. In addition, Bill Pollard has kindly provided the following independent assessment of this item. Note Bill's points about the characteristics that give this one away as a fraud. "The M&NA tag is definitely a fake. 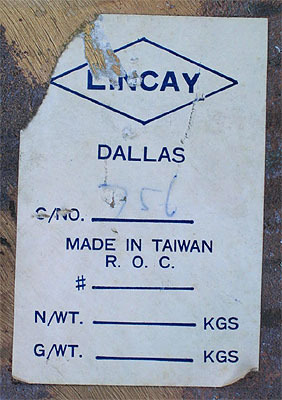 I have personally been in the antique store/flea market in Marshall that is (or was) selling these things, and I personally saw a cigar box with at least a hundred of these tags. They are nothing more than old brass dog tag stock. The tags have varying degrees of chemically induced aging. Note the metal "flash" around the slot at top of tag... looks freshly cut, not like a tag that was used for 50 years. If you saw the tag in person, it would be obvious. It's much smaller than a traditional baggage tag, and much thinner than even the tool checks and other brass tags of the era in question. This tag is the "later" fake version with ARK. The "first" fake version abbreviated Arkansas as AR -- a postal abbreviation that didn't appear until half a century after the M&Ana's demise." Suffice it to say that the ease of counterfeiting baggage tags means that collectors should carefully scrutinize potential purchases and consider the same advice given above with regard to badges. Bathroom Fixtures. Yes, even these have been faked with railroad-related tags. In mid 2007 we received the following note from a collector: "Came across your page on fake Pullman Silver pieces while trying to authenticate a tub and accompanying box of bathroom fixtures marked "Property of Pullman Silver Palace Car Co". I became rather suspicious when I saw it still had affixed to the back of the toilet paper roll holder (which carried the plaque mentioned above) the original manufacturer's tag that read "Made in Taiwan. A-America Inc. Seattle, WA". I called A-America and they confirmed that they did indeed make brass bathroom fixtures over 20 years ago." [Thanks to JK for the note]. Blankets. Blankets that were used in sleeping car service were often marked with either a railroad marking or a "Pullman" marking. Pullman was an independent company that provided premier sleeping car service. Railroad-marked and Pullman-marked blankets are very collectible, but we have received a report that reproduction Pullman blankets are now being made by a company that specializes in reproduction antiques. The blankets are rust color with an early cross stitch pattern and are of high quality. We do not know if their reproduction status is clearly indicated, but collectors are advised to closely scrutinize any blankets that closely match this description. More details will be provided when received. Bottle Openers. Bottle openers marked "B&O" are not from the Baltimore & Ohio Railroad but rather from the Bang & Olufsen audio components manufacturer. It seems that these bottle openers have been (and still are) used as promotional items by that company. See link. However, they have been showing up in internet auctions represented as railroad memorabilia. Cuspidors or spittoons in several sizes with weighted bottoms, often cheaply made of thin brass or copper/brass, sometimes with cracks or seams not fully soldered. A small locomotive or stagecoach appears over a marking. Reported markings are: Union Pacific (most common), Northern Pacific, Rock Island, Santa Fe RR, Pony Express, Butterfield Overland Stage. They may also appear with tobacco company and other advertising names as well as Wells Fargo markings. Brass lamps, cupsidiors and other items with tags such as "property of Pullman Company" or "Pullman Silver Palace Car". There NEVER was a Pullman Silver Palace Car Company, although there was a Wagner Silver Palace Car Company. Signs. Brass signs are being produced overseas and imported into the U.S. 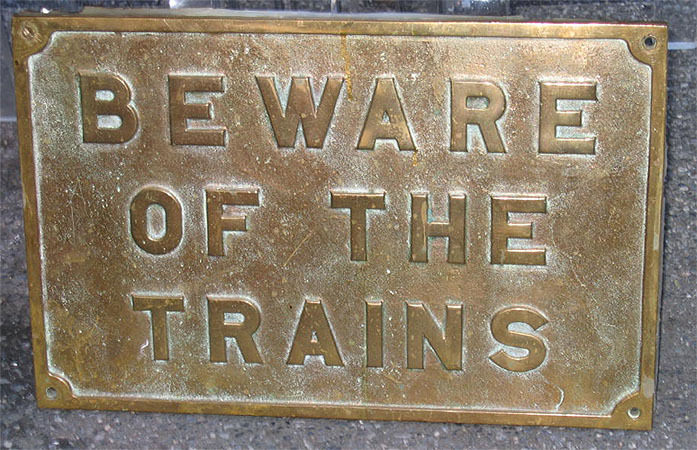 The example shown at right says "Beware of the Trains". It was found in a New York City flea market, complete with import sticker on the back. It measures 23 1/2" wide and 15 1/2" high. Click on images for larger versions. "Hand Bells" :Counterfeit railroad-marked brass bells are appearing regularly on internet auctions. The most common examples have PRR keystone (logo for the Pennsylvania Railroad) cast or cut into them. The larger ones have a mounting bracket, the smaller ones a wooden handle. The larger bells are sometimes listed with a tale that they were used in stations to signal the arrival of trains. The smaller ones with the wooden handles are sometimes listed with a tale that they were used to call people to the dining car.These have been around at flea markets for 20 years or more and are strictly fantasy items. However some people are being fooled. A larger one with a bracket was recently bid up to over $300 but wasn't sold because it didn't hit the minimum. While the PRR marked many unusual items, they didn't mark brass bells. There are also fake brass bells marked for the Erie Railway, "New York Central Rail Way", "Central Pacific Railway Line," and perhaps other railroads. Note that this warning applies to small, hand-held bells. There are authentic bells in the railroadiana hobby -- usually massive, heavy, cast bells used on locomotives and other moving equipment. Such bells may weight a couple hundred pounds. These are not easily confused with the lightweight, fantasy items discussed here. Update early 2012: We received the following email in early 2012: "While I do agree that all of the hand bells and small bells seen on Internet auctions and in some antique stores are fake, it should be noted the Railroads such as the PRR and NYC did mark their tugboat bells. The Pennsy marked their tug bells with the tugboat number date and "PRR". I attached a photo of a bell that has been in my collection for a number of years. I know of two other PRR tugboat bells that I am 99% sure are legit. I have hesitated to publish photos as I have been afraid someone will try to copy it, but it's sort of like a builders plate. Once you hold a legit item in your hands it's easy to spot the obvious fake. The photos are of a bell off of the PRR Tugboat Altoona (PRR #10) built in 1906 at the Sparrows Point Shipyard, Hull # 203205, 197 Ton, Draft 11.8', Length 62', Beam 24'." Thanks to DY. Click on the image for a larger version. Buckles. In addition to the infamous Wells Fargo fake buckles, there are also many fake railroad buckles, often aged to look authentic. 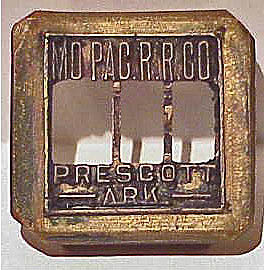 An example is the "Union Pacific RR" buckles shown at right, which uses the same logo that often shows up on other fake brass items like spittoons. Update: We received the following email in Spring, 2015: "In review of your article of bogus or fake buckles, I would suggest caution to avoid throwing the baby out with the bath water. I am a career railroader, having hired out with Western Pacific many years before they and the MoPac merged with the Union Pacific, and have several buckles given to me by the Western Pacific as service awards or safety awards over the years. I have first hand knowledge that such gratuities were awarded at least in the early 1970's, and according to some, even earlier. The consensus among experienced collectors is that these have been imported for the antiques market and are obviously counterfeit. Most show up in a condition that is remarkably (and suspiciously) new for objects that supposedly saw heavy duty industrial use and that are over a hundred years old! However, some have been "weathered" with "aged" appearance. These objects have been showing up increasingly on internet auction sites accompanied by stories of being used by a long lost relative who worked for the railroad or similar tales. While many honest and innocent sellers have probably been fooled by these objects, such fanciful "histories" suggests a more cynical view. Buttons. 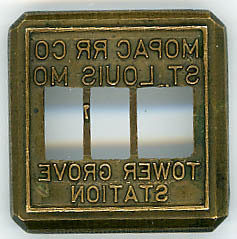 Brass uniform buttons have also turned up with various markings, all marked "Tiffany-New York" on the back. No known authentic Tiffany uniform buttons are known. Markings found: Wells Fargo & Company Guard; Adams Express Company (square box logo); US Indian Service; Pinkerton Detective Agency. Firearms. Firearms that have fake railroad markings have been reported. A collector who specializes in both old firearms and railroad history sent us the following comment: "I have seen old firearms that were "sweetened up" by application, later, of markings. This is particularly true of railroad-marked guns where the time period of use of the gun was not consistent with how the gun was marked, say, U.P.R.R. versus U.P.Ry. Same for Santa Fe. It became Ry. in 1896. Years ago, this guy got a bunch of old worthless double barreled shotguns, sawed off the barrels and marked them as Wells Fargo. He even had got some Wells Fargo letterhead and zeroxed a number of copies of the blank forms and then typed in that such and such a shotgun was assigned to, say, the Alberquerque office. They sold at gun shows pretty well till he was exposed and "reasoned with." Gun collectors don't "reason" very gently. Of course, there are fakes made by informed folks who do their homework first and that complicates the process." Lamps: Lamps that were made relatively recently as fantasy or decor items are showing up on Internet auction sites and other places. In the immediate years before it went out of business, the Handlan Company-- an old and respected maker of railroad lanterns and lamps -- began offering a number of different marker, switch, caboose, or Model 380 bunk lamps with authentic railroad names. In particular, bunk lamps with names attached diagonally on the mounting bracket are suspect. One source says that a buyer could have just about any railroad name placed on such lamps. Another source says that these newer versions were made from a lighter gauge metal and have less bracing that the original versions intended for actual railroad service. 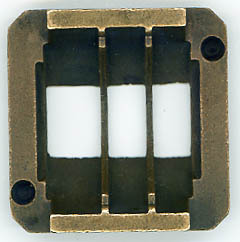 See page on latter-day Handlan lamps. There have also been quite a few fake lamps posing as dining car lamps with tags such as "Pullman Silver Palace Car Company. As noted above, there NEVER was a Pullman Silver Palace Car Company, although there was a Wagner Silver Palace Car Company. Light Fixtures: Some questionable light fixtures have been showing up on internet auctions in late 2002. These are white glass fixtures, rather like a globe but a different shape, that would cover a ceiling light. They have appeared with different railroad logos, including Northern Pacific and Santa Fe. From pictures they look brand new. The fact that a number of them from different railroads would appear at the same time raises suspicions about authenticity. Marbles: Marbles with a railroad logo in them are have recently been offered. As far as is known, these are fantasy items of recent manufacture. These should not be confused with authentic, clear glass marbles that were used by railroad agents to move heavy shipments on loading docks. Spittoons. Recently, crudely made cast iron spittoons marked in large letters "P & R" on the side have turned up on the market. Their crudeness quickly gives them away, but with any new reproduction appearing on the market, several have been sold by well meaning dealers not knowing their true backround. They are poorly made, with a rusted appearance. The bottom of the inside is so poorly cast that it resembles the surface of the moon, with bumps and craters. Authentic cast iron spittoons reflect the pride and quality that their makers took in manufacturing them. They are well cast and machined. Most have the insides coated with porcelain to make them easier to clean. Some people have tried to make their reproductions look more authentic by painting the inside white to give it a porcelain look. Also see Railroad Spittoons. Acknowledgments: Thanks to Bill Pollard, Scott Czaja, Ken Andrews, Dan Allen, Joe Farrell, Bill and Sue Knous, Mark Rossiter, Larry Meeker, Larry Wolfe, Mike Cather, Doug McIntyre, Seth Bramson, Paul Sliger, Eric Miller, Ken Stavinoha, Robert Kaylor, Richard Heggen, Rob Hoffer and other collectors who generously contributed photos and /or information.